The hype surrounding the Premier League has now long been over inflated by Sky television as they look to ‘sell’ their product to the watching public. The importance of matches between sides is often sold as super Sunday although more often than not the final product of 90 minutes does not match with the publicity of the pre-game show. This past weekend however saw a match that more than lived up to the pre-match billing as Jurgen Klopp and Liverpool visited Wembley to play a Spurs side who continue to go from strength to strength under their Argentinian coach Mauricio Pochettino. Both sides had limited time to prepare for this match with their participation in the Champions League, although it could be argued that Liverpool had the easier week with a match against Maribor of Slovenia while Spurs faced the current European champions Real Madrid. Coming in to this match then there were questions surrounding both sides with Liverpool still appearing suspect defensively and without the speed in the wide areas of Sadio Mane and with Spurs having to rotate their squad due to an ever increasing schedule it was suggested that the early stages of this match would be key in dictating the outcome. In the end the home side started in a shape and with a selection that would have come as something of a surprise to Jurgen Klopp. Seeing Spurs play a three at the back system is by no means a shock at this stage of their evolution under Pochettino but the back three is generally combined with a central holding midfielder, usually Eric Dier or Victor Wanyama, but in this case we saw the young academy graduate Harry Winks start in a more advanced role. Hugo Lloris started in goal as was very much the norm, the back three has been relatively settled so far this season with Davinson Sanchez playing centrally with Jan Vertonghen and Toby Alderweireld on the left and right respectively. The choice of Serge Aurier as left wing back was slightly surprising although the Ivorian international would go on to manage the threat of Mohamed Salah very well. On the right Pochettino chose to persist with Kieran Trippier. The midfield three for Spurs saw Winks play as the central player almost as a pivot that held the entire team structure together. Deli Alli was in a slightly more withdrawn starting role than normal on the left and Christian Eriksen was on the right. In attack Harry Kane was supported by the South Korean international Son Heung Min. Liverpool on the other hand lined up in their normal 4-3-3 shape. Simon Mignolet was in goal behind a back four of Joe Gomez, Joel Matip, Dejan Lovren and Alberto Moreno. Jordan Henderson was the single controlling midfielder at the base of the midfield three with Emre Can and James Milner ahead of him. In the absence of the injured Sadio Mane we saw Coutinho play in and advanced role on the left hand side and Mohamed Salah mirror this on the right as Roberto Firmino played as the lone striker. As touched upon above there was a real sense that the early stages of this match would go a long way to dictating the outcome. Still, with that said there was little to suggest pre-match that Spurs would find themselves two goals ahead by the 12th minute. Liverpool seemed not only rattled in the early stages but also unable to effectively deal with the partnership in the attacking third of Son and Kane, With the two attacking players playing off one another and taking it in turns to drop in to deeper areas to connect with the midfield the Liverpool defensive line, and in particular central defenders Joel Matip and Dejan Lovren seemed to be constantly exposed and unsure. Whilst both goals came from quick interchanges and clever movement in the final third it could have been more as Son hit the bar and then failed to pick out Harry Kane in the centre whilst in transition. This image was taken in the lead up to the opening goal for Harry Kane. The Liverpool defensive line of Gomez, Matip and Lovren have found themselves flat, perhaps looking to catch the Spurs forward offside. In the end a simple clipped ball finds the English international forward in behind the Liverpool defensive line and running in to the corner of the Liverpool penalty area. On the image above I have in particular highlighted the position of Matip in the centre of the line of three defensive players. If he was defending in a proactive manner and reading the danger effectively then he should have dropped off of the defensive line by a couple of yards in to a covering position. This slight change of position would have meant that as the ball came forward Matip was positioned to easily deal with the threat. Contrast the example from above showing Liverpool’s defensive orientation with this one from Spurs and you can see the difference in organisation. With Kieran Trippier moving forward to close down the man in possession the right sided central defender has had to move out in to the wide area. 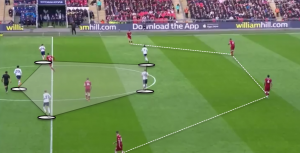 This of course stretches the connection between the three central defenders and creates the possibility of a passing lane that Liverpool can exploit. Spurs however have Harry Winks who has shifted over to the ball side of the field and who is positioned not to press the ball but to effectively cover the potential passing lane with his body shape. Whilst Spurs were progressive in possession of the ball and effective in the transition from defence to attack their defensive organisation was superb throughout as they were compact in the defensive phase thus denying Liverpool any space in which to play. Whilst the compact defensive shape was evident throughout from Spurs it was the positioning and performance in the defensive phase from the attacking and midfield lines that really stood out from the home side. With Sadio Mane injured Liverpool appear to once again be unbalanced in the final third. Whilst Mohamed Salah is a constant threat wide on the right with his pace Coutinho is far more likely to drift in to central areas where he is most comfortable. This meant that Spurs worked hard to shut down any central passing lanes that would have been available for the away side. Having taken an early lead and asserted their dominance on the match we saw Spurs much more content to allow Liverpool to possess the ball in areas from which they could not threaten the home side. The fullbacks retained relatively deep positions in the build up phase although this was mainly because there was rarely an open passing lane to Henderson, the controlling midfielder. 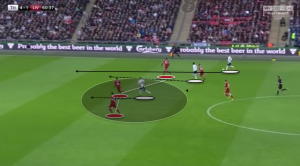 Normally when Liverpool have possession of the ball with their central defenders their fullbacks advance to at least the same line as the two advanced central midfielders and Liverpool play out through the central defenders and the controlling midfielder. In this match however Kane and Son were tight and compact as the first line and Winks, Eriksen and Alli added depth to the defensive structure. This immediately forced Liverpool to adjust their normal game model. This time Liverpool have possession of the ball out on the left side of the pitch and once again Spurs are structured to take away the central passing options. Son and Kane are both covering passes to supporting players and the three central midfielder from Spurs are once again positioned to prevent Liverpool from playing easy passes through in to the central areas. Another impressive aspect of this Spurs side under Pochettino has been the various ways in which they can attack their opponents. Equally comfortable when building slowly against a deep lying opponent or attacking in quick transitions against teams that come out and attack, there are very few discernible weaknesses in this side. Indeed in this match we saw Spurs vary the way that they attacked and controlled the match. There were periods in which Spurs simply slowed the tempo of the game and rested in possession of the ball and they looked just as comfortable in this as they were when attacking vertically. When Liverpool were able to drop back in to a more compact defensive shape then we saw Spurs press up to essentially play in the opposition half. With the back three system used by Spurs there has always been an emphasis on using the Belgian internationals Vertonghen and Alderweireld as playmakers in possession of the ball. The midfielders play more between the lines of the opposition and look to be ready to receive the ball from the central defenders. Here you can see the positioning and spacing of the back three with Davinson Sanchez pinning the centre. When in this orientation Spurs will switch the ball across the back line from left to right and back again until a central passing lane opens up and can be exploited by a hard vertical pass. This time we see Spurs attacking in a fast transition. The presence of Harry Kane in the centre of the field is enough to keep the Liverpool defenders pinned, the threat from the England captain is not one to be ignored. From there then you can see Son making a run to overload the near side of the Liverpool defence and create an opportunity for the pass to be played in to space behind the Liverpool line. As the ball is slipped through and Son is able to continue his run Liverpool find themselves under pressure. Spurs were superb in this match from start to finish as they controlled Liverpool for almost the whole ninety minutes. 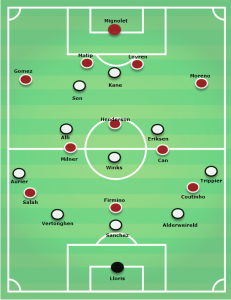 With Pochettino switching Deli Alli in to a deeper role and Son being used to support Kane in the attack line we saw Liverpool’s midfield struggle to come to terms with the movement and positioning of the Spurs midfield. On this form, especially after a tough match in Europe in midweek, it is safe to say that Spurs are genuine challengers for the league title this year. Liverpool on the other hand seem to be existing in a state of flux, there is a real feeling that they need to add depth in the attack, midfield and defence before they can challenge for the title.